Sorry for the hiatus (I feel like I say this every other month) but there's been a lot going on and I can't wait to share with you all! The big reveal will have to wait until everything is hashed out. However, I can tell you that I've been planning lots of exciting new projects for YUP NYC. 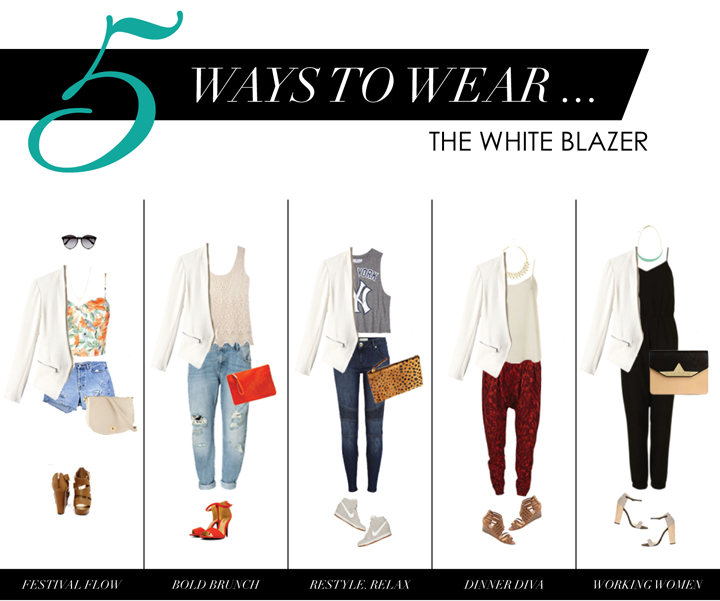 One project that I'm very excited for is the "5 Ways to Wear..." series. I'm a firm believer in getting your money's worth by recycling, re-using & re-wearing items in your closet, so I wanted to showcase how essential/minimal items can be worn on multiple occasion. Let's start with the white blazer. If you ask me, it maybe replacing the classic "denim" jacket because of its versatility. Hollywood starlets such as Rihanna, Kim Kardashian and Ciara can be seen rocking the white blazer from red carpet events to coffee dates. I know a lot of people prefer black or navy and try to stay away from anything white but you would be surprised on how white can brighten, enhance and transform an outfit. Bold Brunch - Bring your outfit to life by coordinating your heels with your purse. Be sure not to over color coordinate by matching everything from your head to your toes. Instead, try subtly matching items to make a fashion statement. Restyle. Relax - Touring your friends around the city? Or maybe you're more of a streetwear kind of girl. Pair a white blazer with a graphic tee and sneakers for more of an effortless, yet pulled together look to create the perfect fall outfit!! Dinner Diva - Take a break from statement accessories and change the focus to your pants! Wear a white blazer to enhance the color or print of your trousers. The cut/fit of a blazer is perfect for one of this year's trickiest trends; harem pants. Working Women - Wear a white blazer over a romper to transform your business causal attire to the ultimate GNO outfit! The minimal blazer not only makes this outfit work appropriate but the seams emphasize your waist, creating a flattering figure.